One way to quickly set a Playback Range is to set it to the same range as a Process Control Block. For example, a short Playback Range is shown below in yellow and an APT Guide Process Control block is shown in green. 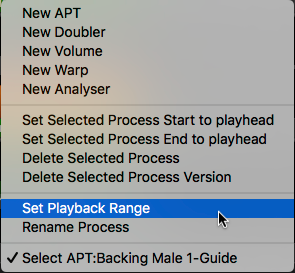 RIGHT CLICKing on the Process Control Block, and selecting "Set Playback Range" shown in blue in the menu shown below, will cause the Playback Range to be set to the same length as the Process Control Block. This is shown in the image below.